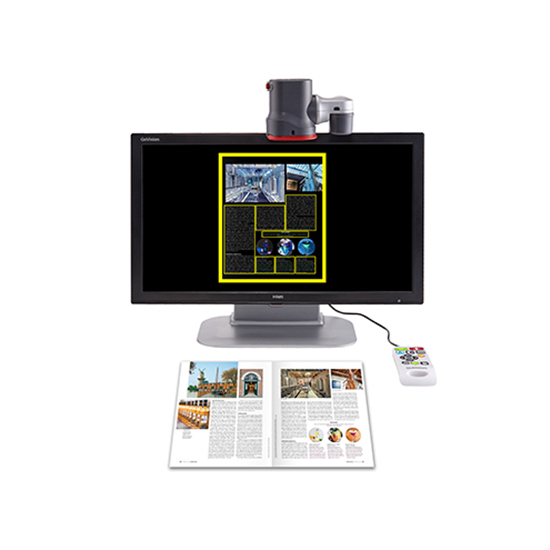 space-saving HD video magnifier that combines all the best features of a desktop video magnifier with transportability and connectivity unrivaled by other products. Take GoVision PRO wherever you need it to magnify text, view photos, check ingredients on food packaging, do full page OCR, do crafts and much more. Use Self View Mode for personal grooming or applying make-up before you leave the house. Take GoVision PRO with you to use the Distance Mode with the 360° camera rotation to view a whiteboard in the classroom or a presentation at work. Productivity Magnified: Look, Listen, Connect and Play! Transportable Read, Write and Distance Video Magnifier with 24” LCD, Built-in OCR, USB Port and Compatibility with Phones, Tablets, Computers. GoVision PRO is an all-in-one, space-saving HD video magnifier that combines all the best features of a desktop video magnifier with transportability and connectivity unrivaled by other products. Take GoVision PRO wherever you need it to magnify text, view photos, check ingredients on food packaging, do crafts and much more. Use Self View Mode for personal grooming or applying make-up before you leave the house. Take GoVision PRO with you to use the Distance Mode with the 360° camera rotation to view a whiteboard in the classroom or a presentation at work. GoVision PRO is easy-to-use wired remote control makes it easy to capture and OCR printed text. Captured text can be read aloud immediately or saved for later use. Students can OCR capture library books or printed test materials then use their favorite pair of earbuds to listen to questions read aloud without disturbing their classmates. GoVision PRO can also open documents, photos and videos saved from your computer or mobile device onto a USB flash drive. Magnification, text color and LED light can be adjusted using the remote or using the multi-function jog switch located on the side of the camera. Transporting GoVision PRO from home to school or work is easy. Simply rotate the camera arm and camera head so they are parallel to the screen then raise a single lever to lower the arm and camera head into position behind the monitor. Connect your smartphone, tablet, PC or Mac via HDMI to magnify email, Google Maps and other programs and apps while away from home. Its HD magnification near and far, built-in OCR, wide range of device connectivity and transportable design make GoVision PRO the perfect all-in-one magnifier for students, professionals and active adults.